Black with crystals. Perfect for a masquerade or elegant soirée. Black faux-leather vinyl with 16 premium crystals embedded into the lace pattern. Black with crystals. 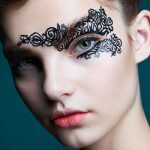 Lace Wing design combines the drama of our Eye Wing designs with the delicacy of a lace pattern. 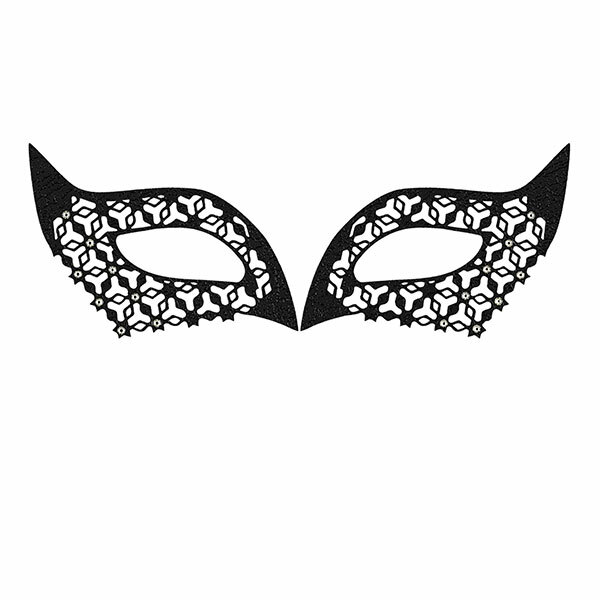 Perfect for a masquerade or elegant soirée, this design comes in a black faux-leather vinyl. Only the sides of the design are adhesive to make the design comfortable and easy to adjust. This product comes with extra adhesive shapes for multiple use. The Crystallised version has 16 premium crystals embedded into the delicate lace pattern for a radiant effect. Part Art Nouveau, part industrial chic, total cat eye sleek. Whirl Cool is very wearable and flattering. Sold in a set of two different designs on one sheet: Zig Zag Cut Crease Liner 1 and Zig Zag Cut Crease Liner 2. Black glitter material on Dazzle material.